‘Knitter’s Pride Pro’, since it’s launch in 2011, has been able to carve out a special place in the heart of fiber artists in USA and Canada. With a product offering that is unsurpassed in quality and so different than the other products available in the market, these highly rated needle that until now were available only in Local Yarn Stores, are now available in premium chain stores across USA & Canada as ‘Knitter’s Pride Pro’. The products reflect our design and workmanship, created to bring joy to your everyday craft. To share and spread the joy that we experience while creating our products. The products that are made with a humane touch and make a difference to the lives of so many people. To offer products that add to the cheer and warmth of knitting. These could be in different hues of colors, in different patterns or in different materials. To listen to our knitters & crocheters and to provide them with products which completely meet their needs and aid them in the practice of their craft. All the needles that Knitter’s Pride Pro so delightfully offers are made by a group of people who have this desire to continuously excel at whatever they do. They come from diverse background and form a part of a much larger Knitter’s Pride Pro family that has helped them attain dignity, happiness and a just place in the society. 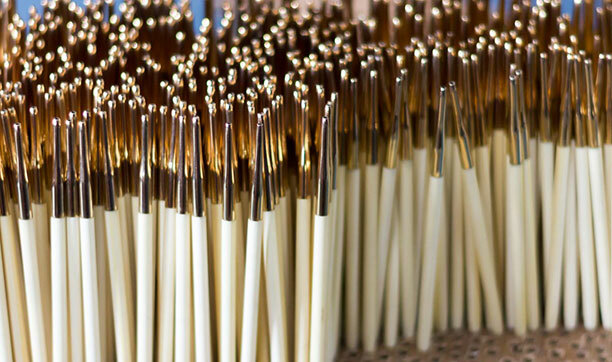 Knitter’s Pride Pro needles are made in a modern factory located in a city steeped in history where people from socially and financially disadvantaged backgrounds come together in order to create some of the best of the needles that you can lay your hands upon. As a matter of policy, Knitter’s Pride Pro offers guaranteed employment to all women who approach it for a job. Almost all the women at Knitter’s Pride Pro have never worked to earn a living and it is with some apprehension that they step inside the Knitter's Pride Pro factory on the first day of their job. However, it is not long before we can find these ladies working on the machines, attaching the cable to the needle tips, packing the needles and checking these needles in the most rigorous way in order to ensure that only the best product reaches our knitters. The money earned by these women helps them run their house-holds but more importantly it helps them ensure that their kids get best education and health care. 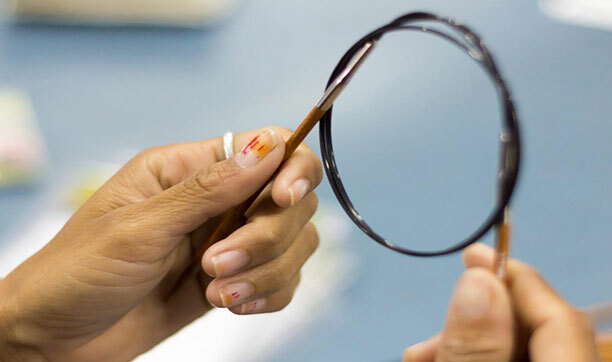 Part of the earnings from the needles that you buy is used to manage and operate a school for poor kids who live in a village and do not have access to formal education. Apna School (which means ‘Our School’) provides education to more than 900 kids, most of whom cannot afford to spend even a US Dollar every month on their studies. Knitter’s Pride runs this school with the help of village elders as a community project and ensures that no child within a cluster of 4 – 6 adjoining villages goes uneducated. All these kids and women join in thanking you for making their dreams and aspirations come true and making our planet a much better place to live in.